Sunday was a terrific day at AeroKnow Museum. To increase people space in the ground floor office, as I was combining files in two two-drawer cabinets so I could carry the smaller one up to the Research Room and fill it with other files, I was visited by Steve Barnes, a local CFI (Certified Flying Instructor) who said he was happy to see the room formerly occupied by the discontinued Pilot Shop put to good use. 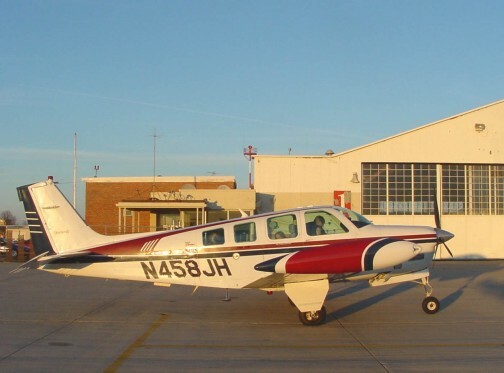 He teaches in a Cessna 172 and Piper Dakota, said he has no preference for either high or low wing aircraft. Both offer advantages. 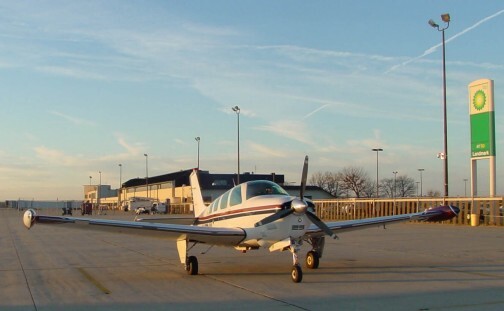 He’s also a member if Illinois Pilots Association, and I hope to interview him for a short article about the life of a local CFI in a future issue of Capital Crosswinds, the chapter newsletter I produce with major help from chapter president John Salz. I also saw the first SOCATA TBM-700 I’ve encountered at SPI, a noisy, exotic turboprop single, smaller than a PC-12; sleeker and sexier. I really wanted to photograph it, but the occupants had BUSINESS on their minds, borrowed the FBO’s loaner car for three hours, and despite the Museum door open and “Welcome” sign by the door and their passing by it en route to the restrooms down the hall, they didn’t visit, and I didn’t bother them outside the Museum. Good looking machine though. Weekends at the airport have a personality of their own. From Monday through Friday, there are usually several birds on the tarmac in the afternoon awaiting the return of pilots and passengers from business in the Capital City. Chances of encountering military machines are better in mid-week. 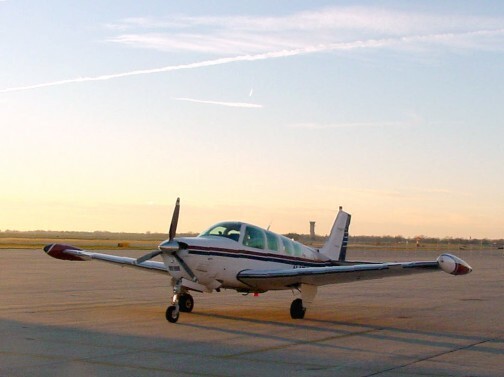 On weekends, even with sunny weather, the ramp is often empty until about 4 or so as local pilots return from recreational sojourns and day charters. Sometimes families returning home to cities not far-far from Springfield drop in to top off their fuel for a final hop to hot dinner and familiar beds. That was true Sunday afternoon. The day had gone well. A young lady had called to parents as she stood at the door’s threshold and as they approached I invited them in, all six, the most people to visit at one time. As we talked about the Museum and answered their questions about the models, it was obvious the family was on the same “VERY INTERESTED IN AIRPLANES” track. I talked with mom and the kids and dad separated from them and read many of the information cards. Everyone participated in the happy repartee. They were returning to their northern Illinois and were in a bit of a rush because they wanted to be on the ground before dark. I showed the pictures of Bonanzas (Vs dating back to 1947 and As) in the picture files and how I could scan and print any of interest in return for support for the Museum.and dad was curious and appreciative of the variety on hand. One of the sprouts asked if I wanted to take a picture of their airplane, and when I said “yes,” dad recommended we head out to the airplane. On the way out, dad deposited folding money into the donation jar (I thanked him of course) I gave him a souvenir flyer about the Museum, and the first picture I took was the family by the airplane. As we walked out, dad suggested they would like to come back and spend some more time visiting, and mom agreed. The airplane is a Cadillac of A36 Bonanzas with a turbocharged engine, great for cruising at high altitudes, long-range fuel tanks on wing tips, air conditioning, deicing on wing leading edges and modern nav aids. They said home is in Aurora, Illinois. I asked dad if he had seen the Aurora model in the Museum (Testor’s model of the supposed SR-71 recon Mach 5 jet replacement) and he said “yes.” Clearly there had been significant LEARNING happening inside. Late in the day the setting sun on a clear day makes the light “hot” with colors not as true as they are earlier in the day. Sometimes the difference can be set right by adjusting in Adobe Photoshop or Corel programs as I tried here. Even so, white is often “brown” and other colors darker. 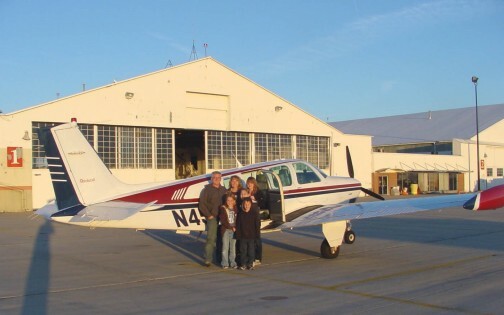 Still, it was fun to chat with the family and record their visit with a fine airplane. In the afternoon photographing from the east side of the ramp so the control tower is visible has its downside. 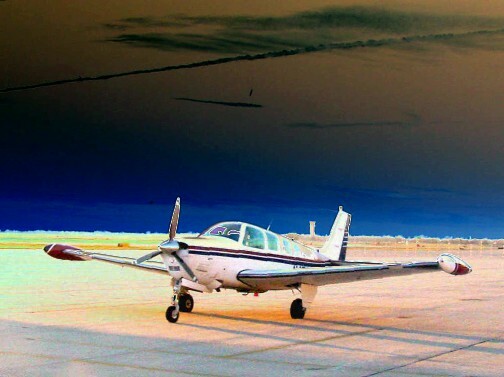 Solarizing the picture above better reveals the airplane while seriously changing the colors; still, an interesting effect, don't you think? My first concern about photographing airplanes with owners’/pilots’ consent (the only way I take pictures at SPI) is to move swiftly even when the light is prime mid-day and to not make them worry about my doing something stupid. Especially when “time is of the essence,” I never approach closer than 15 feet to the airplane. Closeups I can get with the telephoto zoom built into the Sony Mavica. Coincidence of sun and shadow placement and the need for me to keep my shadow out of the picture as much as possible delayed the portrait just a mite as I moved to the side. With the sun at my back and a malfunctioning eyepiece viewfinder, the glare on the big screen display on the camera back made it almost impossible to see what I was framing. So I did not take three more steps rearward which would have allowed me to include the entire tip tank. But I remembered to be still when taking the picture, and the high-definition of the picture, which I will be happy to send to the family along with the rest of the pictures in high-def, reveals them all very sharply. During the entire visit, we were having too much fun to exchange names. I told them I’d post pictures at the blog mentioned in the flyer and if they email me with permission to share their names, I will share them. The lesson learned is that fun comes first with first time visitors, especially when time is short. I truly enjoyed meeting them and it seemed vice versa. Here’s hoping that they return to the Capital City — perhaps to visit the historic sites — and include AeroKnow Museum in their itinerary. That truly is one nice Bonanza. Not a bad looking family either.